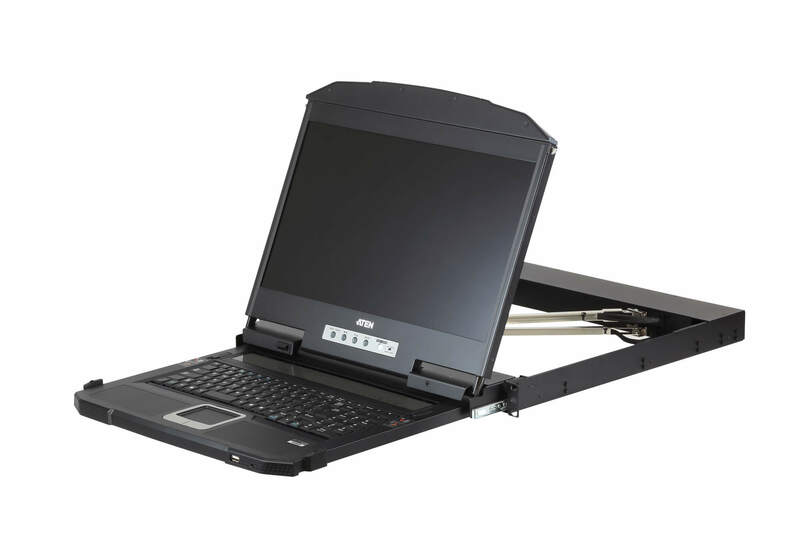 The CL3800 USB HDMI DVI VGA LCD Console is a short depth dual rail LCD KVM console featuring an 18.5" LED-backlit widescreen LCD monitor with an integrated keyboard and touchpad. The short-depth design fits all 19" equipment cabinets, and is especially suitable for shallow racks. In addition to saving valuable space on the rack, the CL3800 also provides a space-saving solution for special environments, such as outside broadcast vans (OB vans) and compact control rooms. 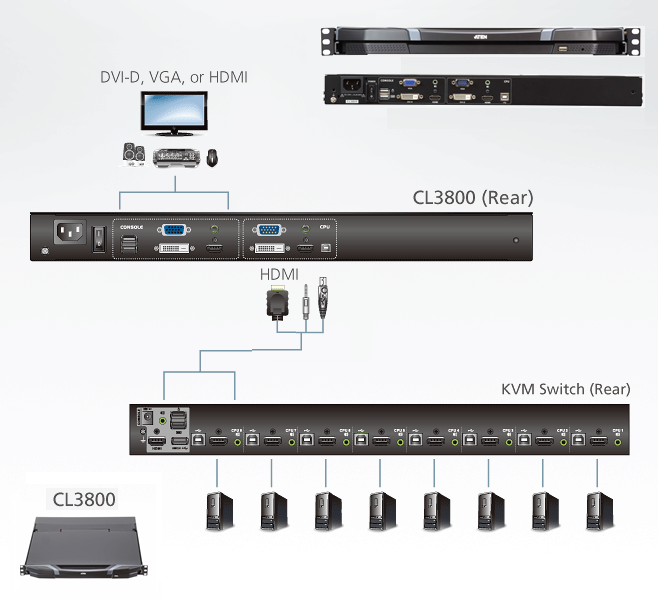 The CL3800 supports three types of video input – HDMI, DVI, and VGA – and provides the ultimate in installation flexibility by allowing users to connect the console and the computer via any of the three types of video source. The CL3800’s full HD widescreen LCD monitor ensures excellent video quality and provides ample viewing area. Furthermore, the dual rail design enables the LCD monitor, keyboard and touchpad to operate independently of each other. To maximize space utilization, the keyboard and touchpad modules can slide back to "hideaway" when not in use, while the thin profile LCD monitor rotates back, flush against the rack, to allow the convenient monitoring of computer activity. For added convenience, users can choose to manage the computer from an external console. The CL3800 features a port for an external USB mouse on the unit’s front panel, while ports for the second KVM console (USB keyboard/mouse and HDMI, DVI, or VGA monitor) are provided on the rear panel. The CL3800 also includes two mini stereo ports for connecting audio speakers. With a rich feature set, the CL3800 is designed to exceed the requirements for space utility optimization, superior video quality, adaptive deployment, and operational versatility, and is ideal for applications such as mobile live streaming in the broadcasting sector or control rooms with limited space in any industry. * Only one video signal (HDMI, DVI-D, or VGA) can be displayed at time. Note - For some of rack mount products, please note that the standard physical dimensions of WxDxH are expressed using a LxWxH format.